“Everyone has a plan. 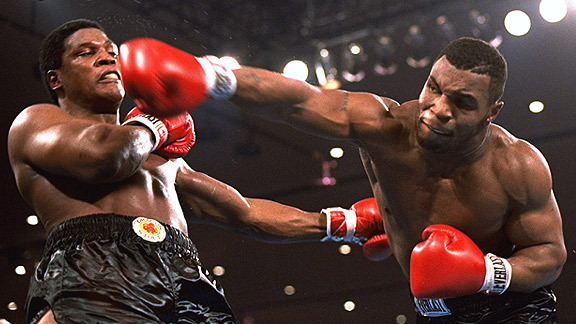 Until I punch them in the mouth.” True words from Mike Tyson. Ryan had a difficult week last week, what with state standardized testing and the accompanying implicit pressure from teachers and school administrators. We felt the effects elsewhere, everywhere, and it took us a while to make the connection that the testing was likely the source of his added stress. Mostly, his anxiety manifested in an explosive temper and frequent eruptions at home. The other huge problem was a familiar one: the school bus. We’re never far removed from an issue with the bus. Either it’s late, or Ryan hates the driver’s rules about assigned seats, or some student or another is bothering him (we’re certain he’s not being picked on, he just can’t stand when people aren’t interested in the same things he is — namely, hockey). Last week was especially precarious. He often exploded with anger over the bus situation after school and in the mornings before heading out of the house. He threatened to break the rules, tell people they were “stupid,” and all manner of various infractions. We knew his anger was a sign of a problem but we did not worry about this threats. Ryan respects school authority (well beyond parental authority) and has never misbehaved in school. He claims the bus is not really school, but we were fairly certain when push came to shove, he was going to behave and save his anger for us. He threatened to refuse to take the bus at all. He demanded he be driven to school by Veronica and picked up by his sitter, neither of which was practical. Taken together, it added several layers of unneeded stress to an already difficult situation. That’s when Veronica rode to the rescue. Recognizing the situation was slipping beyond Ryan’s ability to keep his emotions in check. She offered to drive him to school on the two days she wasn’t working last week. She didn’t do this mid-meltdown, but rather when things were calmer so it wouldn’t seem like an appeasement. As she described it, Ryan, disbelieving, stopped in his tracks and thanked her profusely, the relief pouring out of him. It wasn’t convenient or ideal for her to do, but it was what he needed, and she was wise enough to recognize that and act on it. As much as we wanted to just tell him he had no choice but to ride the bus to school as he had done all year, it was obvious by his increasingly angry outbursts that, given everything going on last week, the situation was beyond his control. Veronica, having recognized this, was able to give Ryan the one thing she could to make the situation better. When you’re in a crisis, sometimes you have to abandon the plan and make adjustments on the fly. That’s Mike Tyson: Stark. Brutal. Honest. Veronica is now negotiating with Ryan, using the possibility of future rides to school on her off days as leverage to entice him to stop his daily complaints about the school bus. Who knows how that will work out. But last week, she stepped in to a lousy situation with the perfect solution at the perfect time. She adjusted the plan. She gave Ryan what he needed. Very important to make note of this. I know how hard standardized testing can be for kiddos like ours. Isn’t my Sister awesome sometimes!